February 4, 2010 (CHARLESTON, SC) – A modern, “green” house on Johns Island, designed by Charleston architect Whitney Powers, AIA, of Studio A, Inc., is featured on Architects + Artisans: Thoughtful Design for a Sustainable World, a new blog written and edited by J. Michael Welton. The 5000-square-foot house rests along the edge of Penney Creek. Working with clients who wanted to make the house as “green” as possible, Powers specifies a host of “green” features, including a geothermal heating and cooling system, a vegetated roof, recycled materials wherever possible, and rain water collection cisterns to provide irrigation for the landscaping. Architects + Artisans’ article primarily focuses on Powers’ use of “new and old materials, inside and out, in unexpected, innovative and subtly surprising ways,” Welton writes. One of the new exterior materials is Eternit, rain-screen panels that, along with large expanses of glass, cover the creek-facing façade. 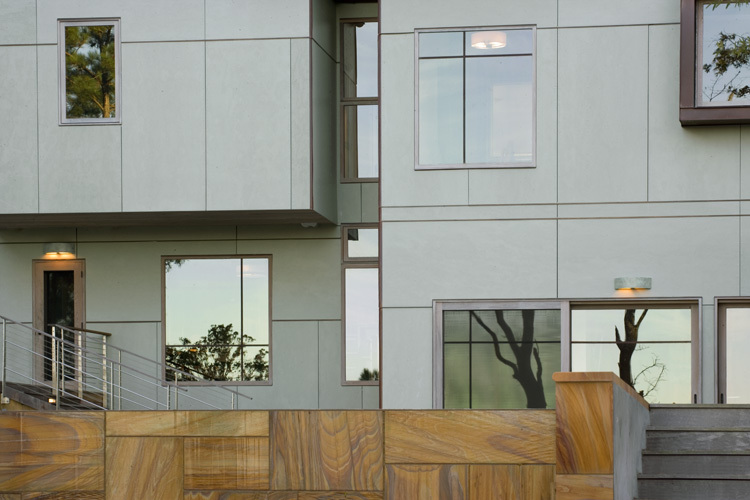 The panels prevent moisture buildup – an important asset within Charleston’s humid coastal climate. Welton spoke with Powers about the material, which architects concerned with sustainability consider a high-performance envelope. An interior material that caught Welton’s attention is century-old white pine salvaged from the homeowners’ barns in Kentucky, which Powers says were milled specifically for this application. For more information on Studio A, Inc., go to www.studioa-architecture.com. Founded in 1989 by Whitney Powers, AIA, Studio A, Inc. is an award-winning, full-service architecture firm located in downtown Charleston, South Carolina. The firm proposes that the responsibility of architecture is to cultivate a language of form that promotes a sustainable culture and landscape, and that touches the emotions of delight, surprise and wonder. From cutting-edge contemporary architecture to the preservation and restoration of historic homes, structures and sites, Studio A is committed to an interactive relationship between the natural and built environments, conservation of energy and natural resources, and an appreciation for a “sense of place” where living, working and playing are connected with the specific idiosyncrasies of culture, climate and natural landscape where they take place. The firm includes Heritage Strategy Group, a planning initiative that elaborates upon issues of the natural landscape through the lens of recreational resources and scenic byways.